There are plenty of people out there who are against using plastic. I understand that it can get you into debt and cause you to overspend. But with so many discounts available for using a credit card, it’s hard not to use one instead of cash when making purchases you’d make regardless. In fact, it’s really not that difficult to earn at least 5% cash back on every purchase you make with a credit card if you give it some thought. So let’s review some tactics to maximize cash back and put more money back in your wallet. This one is a no-brainer. Groceries are probably one the most common expenses a household will incur, and one you cannot really forego. If you swipe with the Blue Cash Preferred Card from American Express, you get 6% cash back on up to $6,000 in annual grocery store purchases. If you somehow spend more than $6,000 annually at grocery stores, you can use online shopping portals to get at least 5% cash back on many grocery items at places like Walmart. In fact, right now if you use the Upromise World MasterCard with the Upromise shopping portal, you get 10% cash back at Walmart! Note: If you have the original Amex Blue Cash card, it comes with 5% cash back on groceries with no annual limit. Not as good as 6%, but no annual fee and no limit once you hit $6,500 in calendar-year spending. This is more low-hanging fruit. 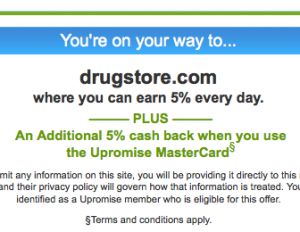 Most of the online shopping portals allow for 5% cash back at the biggest drug stores out there, including CVS, Drugstore.com, Rite Aid, Walgreen’s, and so on. The same goes for top retailers like Kohl’s, Macy’s, Nordstrom’s, etc. If you eat out a lot, getting 5% cash back on restaurant purchases can also be quite lucrative. The Discover it card offers 5% cash back at restaurants from January through March. Once April hits, move restaurant purchases to your Chase Freedom card for 5% cash back at restaurants. Their offer extends until the end of June. As for the rest of the year, if you have the U.S. Bank Cash+ Visa Signature, you can activate 5% cash back at restaurants and/or fast food for another quarter of the year to fill in the blanks. For the record, a lot of card issuers consider Starbucks a “restaurant,” so you should be able to get 5% cash back there as well during the months where you earn 5% at restaurants. There’s also the Upromise World MasterCard, which offers between 4% and 12% cash back on thousands of Upromise Dining restaurants. And it’s not just random places, it’s a lot of places. You don’t even need the Upromise credit card to take part. You can also register your other credit cards in the Upromise Dining Program and earn up to 8% cash back at restaurants depending on your spend. This one is a little trickier since you’ll probably need to rely on rotating category credit cards to get the 5% cash back, unless you go with the PenFed Platinum Cash Rewards Visa Card. If you do, you can earn 5% cash back on gas purchases paid at the pump year round with no limit. The caveat is that you must also open a qualifying PenFed product, such as a checking or savings account. If you’re not down with that, Chase Freedom has six months out of 2014 where you can get 5% cash back at gas stations, and there’s no annual fee! From January through March, and July through September, enjoy 5% cash back on gas up to $1,500 a quarter. The Discover it card also offers 5% cash back on gas from July through September in case you max out your gas purchases or don’t have/want Chase Freedom. You’d probably never dream of getting 5% cash back for everyday household costs like a cell phone, landline, your cable TV, or internet service. But lo and behold, there is the Chase Ink card, which offers 5% cash back in all those categories. The limits are pretty high too. It’s up to $25,000 in annual spend for the no annual fee version of Ink, or $50,000 in spend for the versions with a $95 annual fee. You also get 5% cash back at office supply stores, like Staples, Office Depot, or Office Max, and that comes with plenty of other opportunities to earn 5% cash back. You can even buy gift cards for places like Amazon.com at these office supply stores and enjoy 5% cash back when you do the shopping you’d normally do anyway. This is probably the easiest way to earn 5% or more cash back. There are tons of portals you can take advantage of that come with at least 5% cash back, and if you use a credit card that comes with 5% cash back as well, you’re looking at 10% cash back or more. For example, the Upromise online shopping portal offers 5% cash back at popular stores like Bed Bath and Beyond, Best Buy, Staples, QVC, Sears, Macy’s, Lowes, and many more. If you use one of your cash back credit cards that also earns 5% cash back on online shopping or at specific stores, you can stack your cash back and earn 10% or more, all from the comfort of your own home. You can find these deals with your credit card issuer’s shopping portals as well. One such popular portal is ShopDiscover, which offers similar cash back at numerous stores. At the moment, you get 5% cash back at Bed, Bath, and Beyond when using the Discover it card. If you use it via ShopDiscover, it becomes 10% cash back. This one is pretty easy too, and doesn’t really require a specific credit card. Simply use the online shopping portals mentioned earlier to get at least 5% cash back at places like Orbitz, Hotels.com, Travelocity, and on all types of individual hotels and car rental companies. Don’t forget to use promo codes for even greater savings. Also look out for 5% cash back on travel on rotating rewards credit cards, or 2x for travel purchases on specific travel credit cards (like the Barclaycard Arrival) to maximize your travel cash back. You can even earn cash back and points on ridesharing services like Uber and Lyft with specific credit cards, so when you think of travel, it doesn’t have to be tropical, it can be local and pretty ordinary as well. Do you shop at the Home Depot or Lowe’s a lot? If so, it’s easy to earn at least 5% cash back with rotating rewards cards. In fact, you can even earn 10% by stacking your cash back via the Chase Ultimate Rewards portal (or the other portals mentioned). So why pay cash if you can get 10% back and use coupons? Anyway, that about sums it up. Whenever you purchase something with your credit card, take the time to look for multiple, layered cash back offers, whether it’s from your actual credit card or via a shopping portal. It shouldn’t be hard to triple stack rewards for many items. I’m referring to the combination of a cash back credit card, cash back portal, and promo code. If it sounds like you’ll need a lot of credit cards, or even too many, you might want to consider dumping some of the redundant ones. Or those you rarely use that don’t offer great rewards. Either way, simply taking advantage of the portals with any credit card should earn you a decent amount of cash back, so don’t fret. Just remember to use them before you swipe! Tip: You can use the Wallaby app to keep track of which cards offer the highest cash back in a certain category. Previous Previous post: Why Do Credit Cards Have PINs?